Our 12-day Myanmar (Burma) and Northern Thailand Tour will suit the first time visitor, providing an affordable tour of Myanmar and Northern Thailand's main highlights. 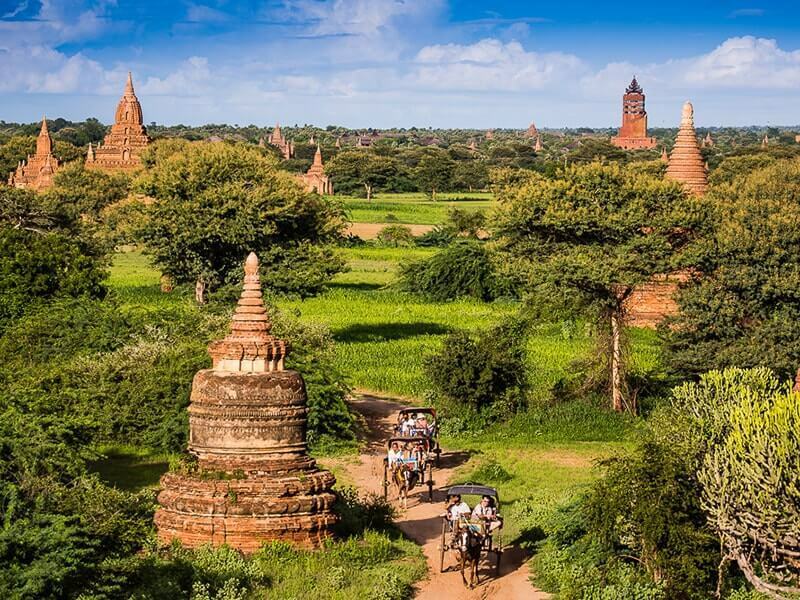 Starting in the former capital Yangon, with the shimmering Shwedagon Pagoda, we fly north to Bagan, the plain of temples and stupas; then Mandalay, a city whose significant charms need to be uncovered; and Inle Lake with its serene stilted villages and interesting tribal markets. 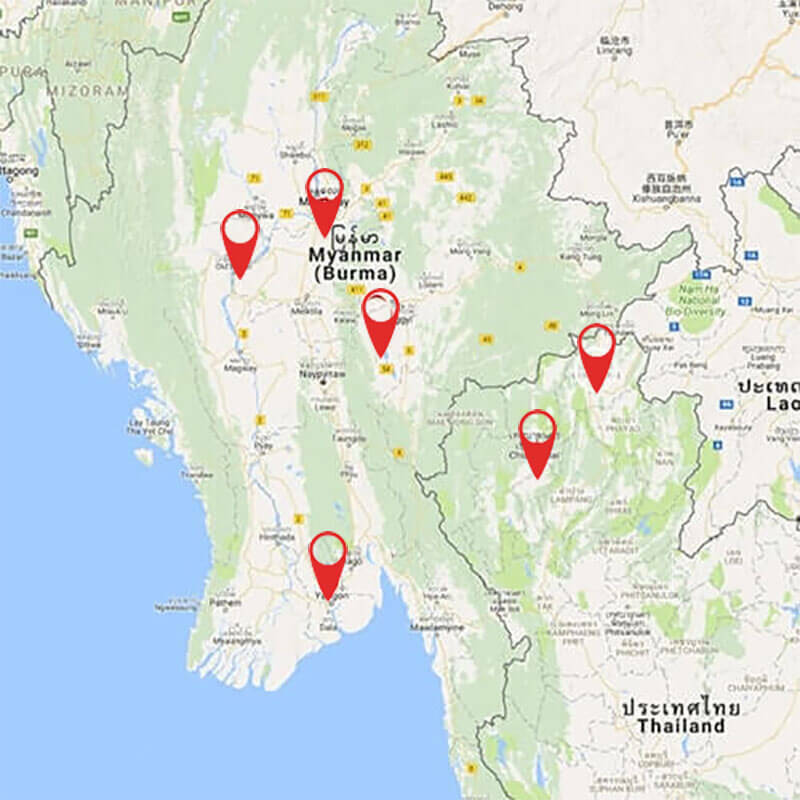 After Myanmar, enjoy a comprehensive tour of the Northern Thai countryside discovering ancient palaces, temples and Buddhist shrines in Chiang Rai and Chiang Mai. Mingalabar! Welcome to Myanmar! 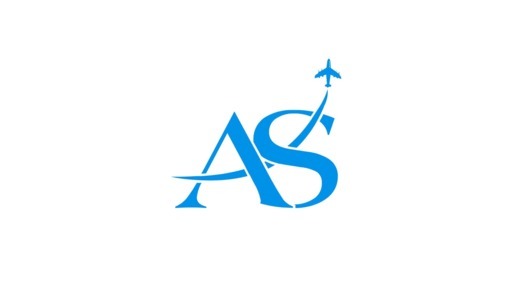 Upon arrival in YANGON, you will be welcomed by our Asia Senses guide, then be transferred to your hotel for check in. Take a short break at your hotel. The half day city tour in the will introduce the main highlights of Yangon, including the revered Chaukhtatgyi Pagoda which is built in 1966 and houses a striking reclining Buddha image that measures an impressive 65 metres long and 16 metres high. Then take a visit to Sule Pagoda known in Burmese as the Kyaik Athok Zedi, and surrounded by busy streets, a market and colonial era buildings. After that, we walk around and take some photos of Yangon City Hall, Yangon Region Court, and Independence Monument which is located in Maha Bandula Park. 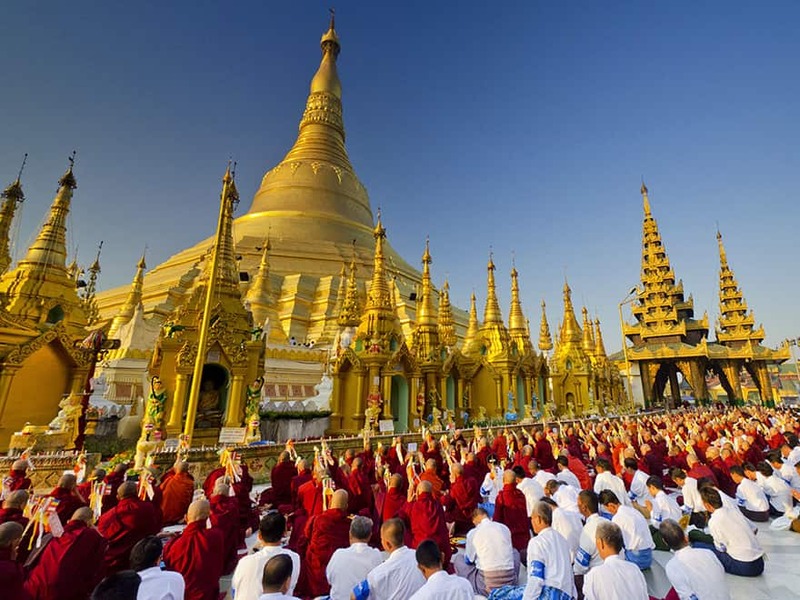 In the late afternoon, we will visit the famous Shwedagon Pagoda - Yangon’s most famous landmark. The massive 99 meter high gold plated pagoda with the diamond studded spire set on top of a small hill in downtown Yangon. Its massive bell-shaped golden spires are plated with 60 tons of gold, while the tip of the stupa is inset with diamonds, rubies, sapphires and topaz. Enjoy breathtaking views of the golden stupa from this vantage point. Today, catch a domestic flight to BAGAN. On arrival, you will be welcomed by our local guide and transferred to the hotel for refreshment and leaving the luggage. Upon room availability, you can get room for early check in (not guarantee). Originally founded in 849 by the Burmese as the capital of their Empire, Bagan is one of the most amazing archaeological sites in the world with more than 2,000 Buddhist monuments and towers over a green plain, an area of 42 square kilometres (16.2 square miles) on the eastern bank of the Ayeyarwaddy River, testifying to the power and status of Bagan in bygone times. We begin our Bagan sightseeing tour by visiting golden Shwezigon Pagoda, constructed in 1057 by King Anawrahta, who is considered the founder of the Burmese nation, as a place of prayer and meditation. After that, we visit Ananda Temple, one of the most surviving masterpiece of the Mon architecture. 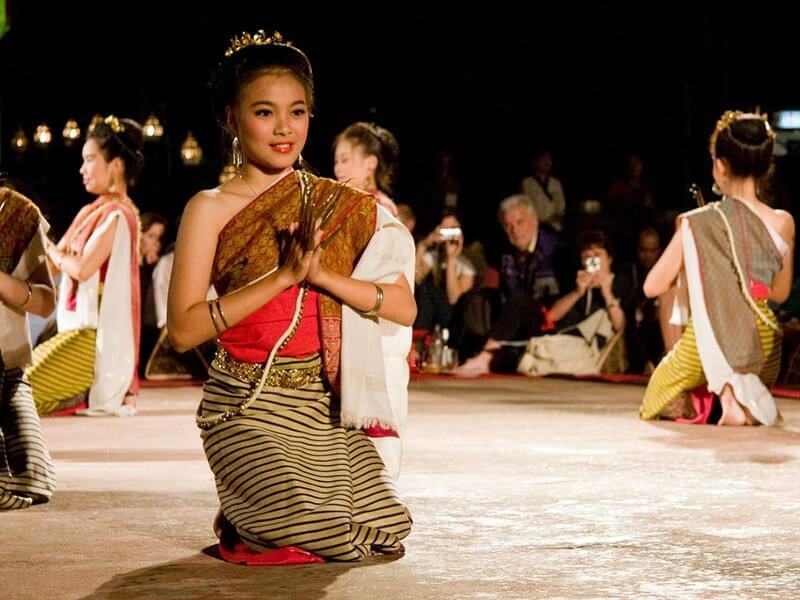 Also known as the finest, largest, best preserved and most revered of the Bagan temples. Then, we move to visit Thatbyinnyu Temple - the tallest temples of all monuments in Bagan; 61m high overlooking the Bagan scene. Have lunch then return to hotel for a short break to avoid the midday heat. In the afternoon, drive to Myingabar Village to visit a lacquer ware workshop - one of Myanmar's most treasured handicrafts. Continue to visit Dhammayangyi Temple - one of massive temples in Bagan. It was built in 12th century by Narathu King. It is infamous for its mysterious, bricked-up inner passageways and cruel history. To conclude our Bagan tour today, experience by local ox-cart way to Shwesandaw Pagoda, a perfect spot to enjoy a magnificent sunset. Enjoy sunset from the temple then transfer to the hotel. OPTIONAL: Wake up early this morning for a 45-minute Hot Air Balloon ride to watch the stunning sunrise over the temples of Bagan. Seeing hot-air balloons flying over Bagan is one of the most iconic images of Myanmar. Then we take a stroll through the lively Nyaung U Market for a great photo opportunity and offers a colorful display of fruit, vegetables, flowers, fish and textiles. Morning time is the best time to visit the market, as you would see it at its liveliest and ways of life of local people. After that, we drive to Minnanthu Village which is located near central Bagan. On arrival, meet with friendly and hospitality villagers who will take you around their village. It is a unique opportunity to observe their daily life. Later, return to the hotel for breakfast and spend the rest of the morning at leisure. In the afternoon, we will visit Gubyaukgyi, a cave temple with its unique architecture shows Indian influence and the elegant Htilominlo Temple, a large majestic structure towering 46 meters high with fine plaster carvings and glazed sandstone decorations. Then we take a visit Nat Hlaung Kyaung Temple and Bu Pagoda. As the day comes to an end, embark on a boat ride along Irrawaddy River, offering magnificent views of the temples and riverside villages as the sun begins to set. 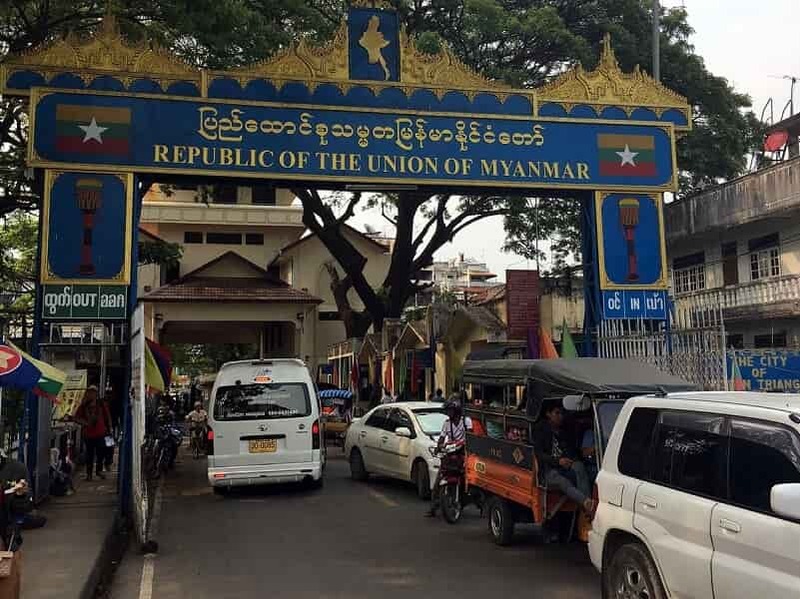 This morning, you will be transferred to the airport to take domestic flight to MANDALAY, the second-largest city and former royal capital of Myanmar’s king in 1885. Upon arrival in Mandalay, drive to Amarapura to visit Mahagandayon Monastery, home to some 800 monks and one of the major destinations of Mandalay tour. If we visit at 11:00AM, you can watch the whole monastery eating silently. Afterward, take a leisurely stroll over a historic U Bein Bridge. 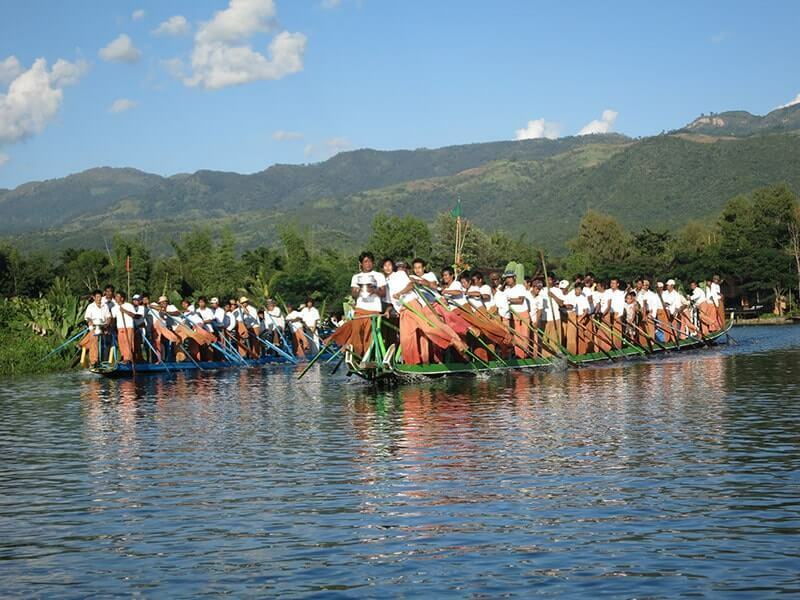 This beautiful 1.2 kilometre-long structure built from teak planks. It was built in 1851 and cross over the Taungthaman Lake. Then head to your hotel for check in and take a short break. Enjoy a lunch at a local restaurant. In the afternoon, continue to visit Shwe Nan Daw Kyaung (or Golden Palace Monastery) to marvel at its carvings, particularly the interior gilded Jataka scenes (past-life stories of the Buddha) and Kuthodaw Pagoda (also known as the world’s largest book), named after the 729 marble slabs inscribed with Buddhist teachings. Towards the end of the day, climb up covered stairways to 240 meters high Mandalay Hill and enjoy the spectacular panoramic views during sunset - an amazing photo opportunity. Begin the exploration this morning by a short transfer to Sagaing District. On arrival, visit Sagaing Hill where you can observe white and gold pagodas along the Irrawaddy River from top of hill. This hill has numerous pagodas, monasteries and meditation centers known as a peaceful place for Buddhist studies. It is a place one can enjoy the magnificent views over Sagaing hill. Visit Soon Oo Ponya Shin Pagoda, U Min Thonze Caves which are located on the top of the Sagaing Hill. Alter that, drive to Inwa, en route make a stop to visit handmade silverware workshop. It's well-known for religious structures left over from several reigns as the nation's capital, from the 14th to the 19th centuries. To reach Inwa, take a short boat ride from the boat jetty in Sagaing side. Following lunch, your excursion to Ava can be made with a horse cart. Visit to Ava Leaning Tower called Nan Myint. 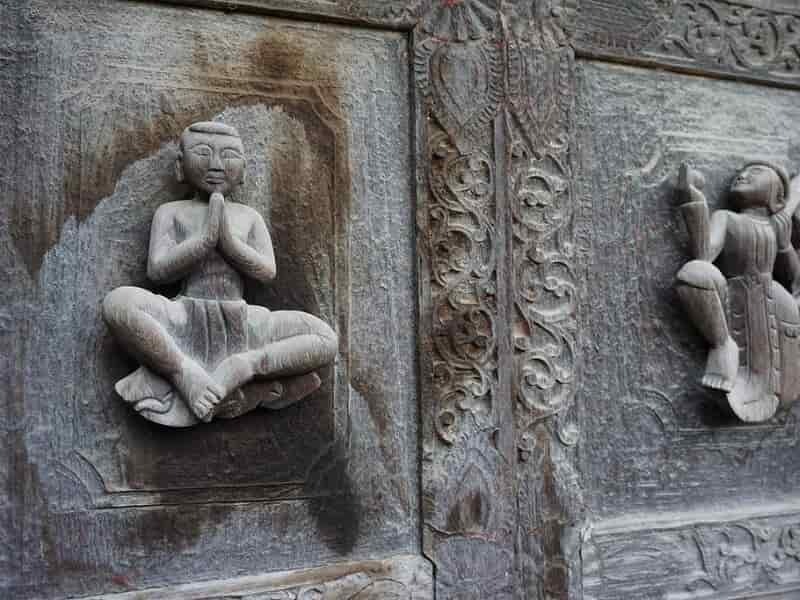 Nearby, it is possible to visit Maha Aungmye Bonzan Monastery, located inside of Inwa Palace. From here, proceed to Bagayar Monastery which is famous for its traditional architecture, with soaring tiered roofs and heavy teak doors carved in high relief of celestial figures bearing lotus buds. At the end of day, return to Mandalay and free at leisure. This morning, checkout from your hotel and transfer to the airport for a short flight to Heho Airport. Upon arrival, you will be welcomed by our guide and driver then take a short transfer to NYAUNGSHWE. On the way, make a stop to visit Shwe Yan Pyay Monastery - an old teak monastery with unique features..
Then, transfer by local boat to the hotel in INLE LAKE, one of Myanmar's most anticipated destinations and all the hype is justified. The lake is 22km long, and is densely inhabited by many different tribes in Taunggyi District of Shan State. Check in hotel and take a short break. 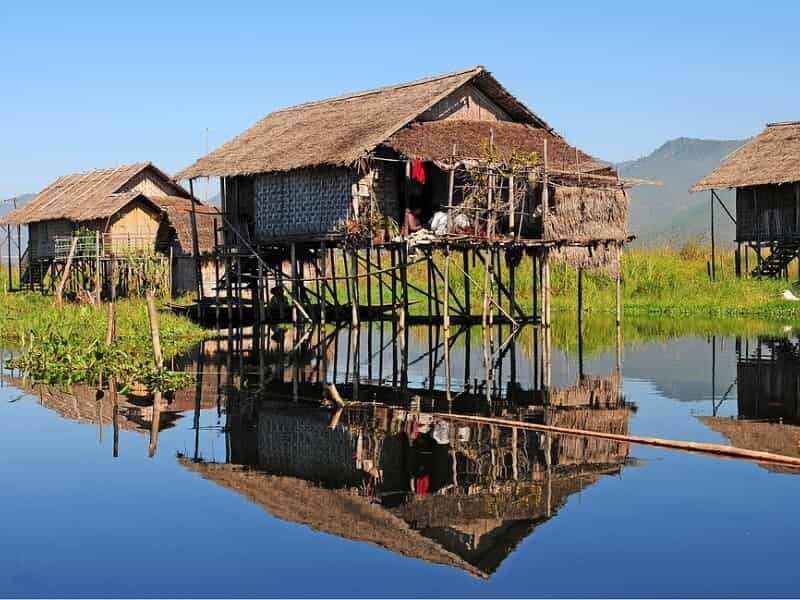 After that, take an excursion by boat on Inle Lake which offers you the chance to visit the famous leg-rowing fishermen, local methods of fishing and see their floating villages & gardens where fruit and vegetables are grown. The highlights today also include Phaung Daw Oo Pagoda the holiest religious site in Southern Shan State, which contains five sacred Buddha images covered in gold leaf and Nga Phe Chaung Monastery, a wooden monastery built on stilts and the oldest & largest one in Inle Lake. We also visit handicraft workshops such as blacksmiths, silversmiths, weaving looms, etc. After breakfast, take a visit the lake’s five-day market for unique insight into the local cultures of the area. The market is called “five-day market” because the local people rotate between 5 different locations over a 5-day-period. Villagers from the surrounding hill tribes come to the market to sell and trade tomatoes, eggplants, scallions, peppers, betel, beans, garlic to cheroots. There are some people selling lacquerware, Buddha statues, carvings, longyis, Shan bags, textiles, ornamental objects and other hand-made goods for both local use and trading. From the market, we continue broad down a small canal leading to Indein Village. On arrival village, visit Nyaung Ohak and Shwe Inn Thein, two groups of ancient pagodas. Explore the area on foot and wander through the beautiful pagodas. Then, climb up to the top of a hill which is covered with picturesque ancient stupas. Enjoy magnificent views of the lake below from this vantage point. After enjoying the visit to Indein, have a break for lunch. In the afternoon, continue along the lake for additional sightseeing before returning to the hotel in the afternoon. This morning, you will be transferred back to the airport for your short flight to TACHILEIK, the border town with Thailand. Upon arrival, our local guide will pick you up then transfer you to Tachileik/Mae Sai border. Our guide will assist with immigration formalities then transfer you to the hotel in CHIANG RAI to check in. Rest of the day is at your own leisure. In this morning, embark on a short transfer and begin journey to Doi Mae Salong Mountain, home to the native Yao and Akha hill tribe villagers. Stop at a tea plantation to try some fresh hot Oo Long Tea in the morning while taking in the splendid views of surrounding tea plantation. After that, take a leisurely walk through the lush greenery and smell the lovely aroma of homegrown tea and coffee. Visit one of the local house and learn the interesting process of making wet tea, dry tea and sweet tea powder from the fresh green tea. If you visit in January, appreciate the gorgeous Japanese cherry blossoms covering the mountainside. Your lunch will be served at a Yunnanese restaurant. After lunch, continue to visit some villages of Yao and Akha hill tribes. Upon arrival villages, you will be greeted by friendly villagers. Observe their indigenous lifestyle and discover their ethnic cultures and daily life in their villages. We also stop at a local co-op store, offering a range of home-made products including wine, medical herbs, and other locally grown produce. In the late afternoon, watch the sun goes down behind the Mae Salong Mountain. Return to your hotel then spend the rest of the evening at own leisure. Overnight at hotel in Chiang Rai. 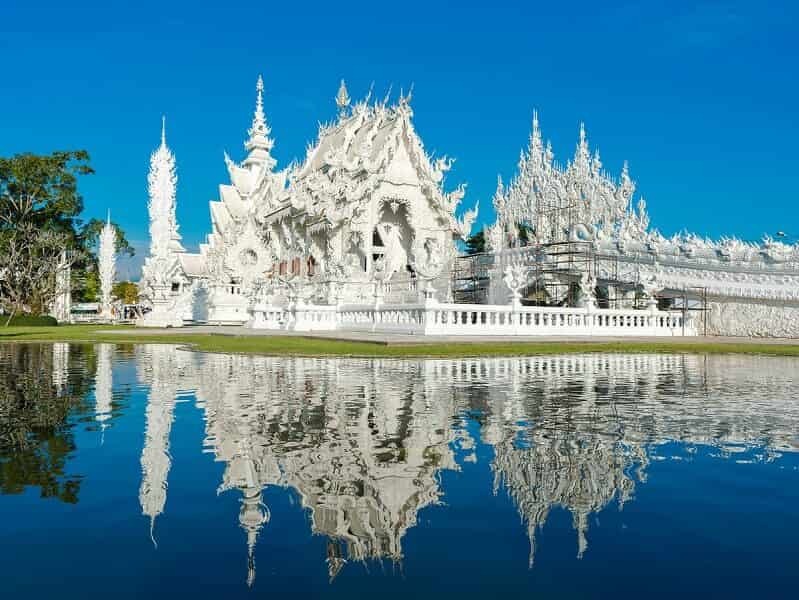 After breakfast, take a visit to beautiful White Temple (Wat Rong Khun), one of the most recognizable temples in Thailand. The Wat Rong Khun was designed by Chalermchai Kositpipat, a famous Thai visual artist. This unique temple and modern temple features Hindu and Buddhist architecture that stands out through the white color and the use of pieces of glass in the plaster, sparkling in the sun. Continue your visit to the Ban Karieng Ruammit Camp. You will see how the elephants works, then have chance to ride on the elephant through the mountains with views of pineapple and banana plantations as well as the river valley for an hour. Have lunch then return to your hotel to check out. In the afternoon, make your way to CHIANG MAI, a land of misty mountains and colourful hill tribes, a playground for seasoned travellers, a paradise for shoppers and a delight for adventurers. It takes around 3 hour drive to reach the destination. Along the way, pass through the beautiful mountain of the northern Thailand. Upon arrival in Chiang Mai, you will check in hotel and enjoy a restful evening. In the morning, our guide will take you to visit the most interesting temples in Chiang Mai such as Wat Phra Singh which is also known as “The Monastery of the Lion Buddha” or “The temple of the Lion Buddha”. Then proceed to Wat Chedi Luang which was built in 1391 by King Saen Muang Ma (1385-1401) to hold the ashes of his father, Ku Na. 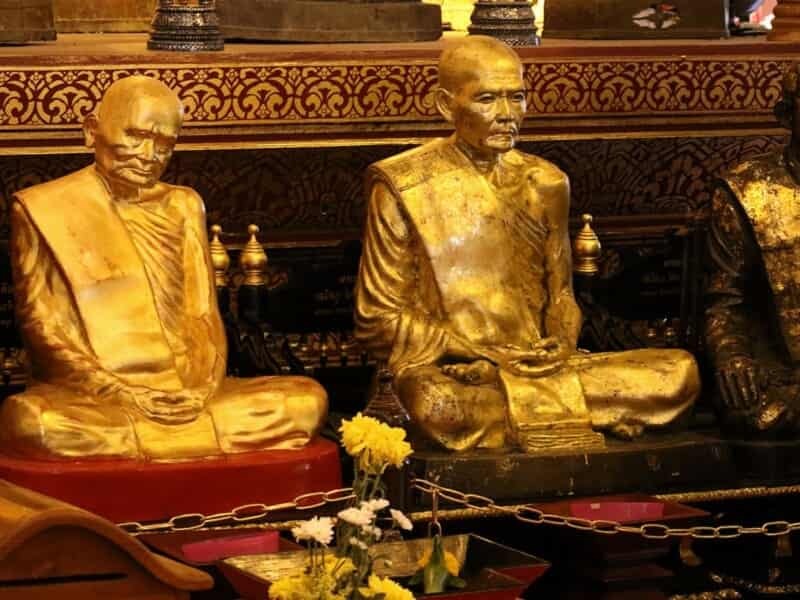 And Wat Chiang Man, Chiang Mai's oldest temple was established by the city's founder, Phaya Mengrai. Continue to explore Wat Suan Dok, best known for its large number of pagodas in which the ashes of the Chiang Mai Royal Family are enshrined. It was built in late 14th century by King Kue Na, the sixth king of Mangrai Dynasty. Before having lunch, visit Wat Jet Yot, meaning the Temple of Seven Spires, after its famous centrepiece, a seven-spired chedi. In the afternoon, climb up the Doi Suthep Mountain, then take a visit to the golden temple Wat Phra That, one of northern Thailand's most sacred temples, and its founding legend is learned by every school kid in Chiang Mai. Enjoy the magnificent views of Chiang Mai from the top of the mountain. Return to your hotel then spend the rest of the day at own leisure. After the breakfast, highlight your day by participating in a Thai Cooking Class. Try a new experience in an old Thai styled house that allows you to experience the real ambiance of traditional Thai architecture. The program starts with a tour at the local fresh market. The guide would be very pleased to show you the different varieties of herbs and vegetables which are used in Thailand cuisine. Stroll through stalls where fresh fruits, vegetables, herbs and meats are sold. Buy ingredients, plumpest chicken, freshest fish, herbs and vegetables which will be used in cooking class. Then, head back to meet our chef who will host the cooking class. During this cooking class, the chef will teach you traditional cooking techniques of Thailand, while introducing you to the classic food combinations, which are making Thailand's food so popular worldwide. Prepare ingredients, cook several dishes by yourself. Then seat down and enjoy what you have made. Following the cooking class, lay back until your guide and driver provide you with a short transfer to airport for your onward flight to BANGKOK. We hope you have enjoyed the Discovering Burma And Northern Thailand and look forward to serve you in another trip.